Subway's Steak & Cheese is made with thin slices of steak topped with melted cheese. It is one of several Select sandwiches the chain offers; others include the Subway Club and the Chicken & Bacon Ranch sandwich. Nutritional values for all Subway sandwiches are figured with sandwiches on 9-grain wheat bread topped with lettuce, onions, tomatoes, green peppers and cucumbers, according to the company's nutritional data charts. In the case of the Steak & Cheese sub, the cheese it comes with is also factored into the totals. 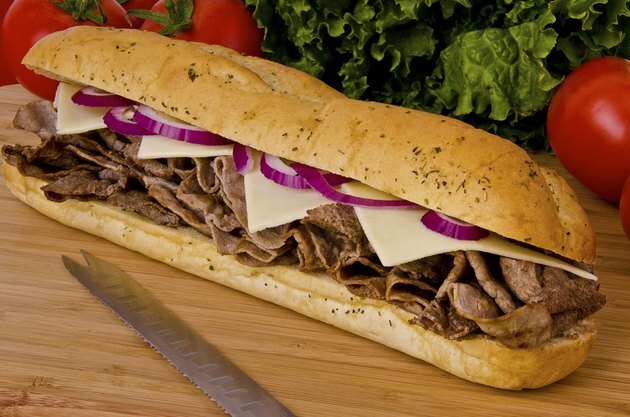 Subway's 6-inch Steak & Cheese sub has 380 calories, and 90 of those calories come from fat. The calories is a particular food indicate how much energy it contains, the Food and Drug Administration reports. How many calories you need to eat each day depends on factors such as your age, weight, activity level and whether you are trying to lose, gain or maintain your weight. If you consume 2,000 calorie a day, the Steak & Cheese sub is equal to 19 percent of your total recommended daily calories. The Steak & Cheese sub contains 10 g of total fat, 4.5 g of which are in the form of saturated fat. It also contains 50 mg of cholesterol and no trans fat. You should restrict your fat intake to no more than 65 g a day, and of that total no more than a third should come from saturated fat, the U.S. Department of Agriculture recommends in its Dietary Guidelines. Diets high in saturated fat put you at risk for obesity and related health conditions. With 1,230 mg of sodium, the Steak & Cheese sub contains slightly more than half the recommended daily intake for sodium. Regardless of your total daily caloric intake, sodium intake should be less than 2,400 mg to help reduce the risk of serious health conditions such as high blood pressure, the USDA advises. Many of the ingredients in the Steak & Cheese sub contribute to its carbohydrate content, especially the bread. The total carbohydrate content for the 6-inch sub is 50 g, and the carbs include 5 g of dietary fiber and 6 g of sugars. Because carbohydrates provide your body with fiber and other nutrients, the USDA's Dietary Guidelines recommend that 45 percent to 65 percent of your caloric intake come from carbs. Steak and cheese both add to the protein value of this Subway sandwich. The 6-inch sub has 26 g of protein, making it an excellent dietary source of the nutrient. The Dietary Guidelines do not include daily intake recommendations for protein because of how prevalent it is in the American diet, the FDA reports. Fast food isn't typically thought of as being a good source for essential vitamins and minerals, but the Subway Steak & Cheese sub does contain several of these nutrients. Each 6-inch sandwich contains 20 percent of the recommended daily intake for vitamin C and iron and 10 percent of the recommended daily intake for vitamin A and calcium, Subway reports in its nutritional data charts.